Deteriorating patients often present with suboptimal vital signs. If these are not recognised by healthcare staff, the patient’s condition can deteriorate further, potentially leading to serious complications and even death. Despite efforts to improve ward nurses’ recognition of, and responses to, deteriorating patients, this aspect of care has been found to be suboptimal. Aim To identify factors that influence ward nurses’ responses to deteriorating patients. Method A literature review was undertaken, based on the research question ‘What factors influence the trigger component of ward-based registered nurses’ afferent response to deteriorating patients?’ Several electronic databases were searched electronically to identify relevant articles, alongside hand-searching. Inclusion and exclusion criteria were set to determine which articles should be included in the literature review. Findings Nine studies were identified for inclusion in the literature review. 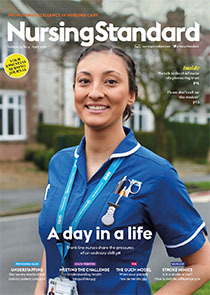 Four main themes that influenced ward nurses’ responses to deteriorating patients emerged: communication, diurnal and weekend variation, knowledge and attitudes, and nurse staffing levels. Conclusion Effective communication was identified as an important factor in improving ward nurses’ responses to deteriorating patients, as was improved knowledge of ‘do not attempt cardiopulmonary resuscitation’ (DNACPR) orders. It was also identified that increased ward nurse numbers improved responses to deteriorating patients, as did increased availability of senior healthcare staff, which enabled junior staff to escalate care.